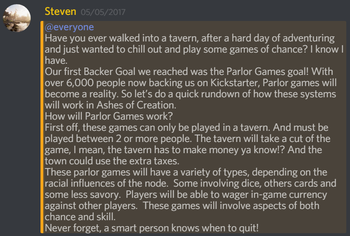 Ashes of Creation Kickstarter goals. Ashes of Creation Kickstarter packages. 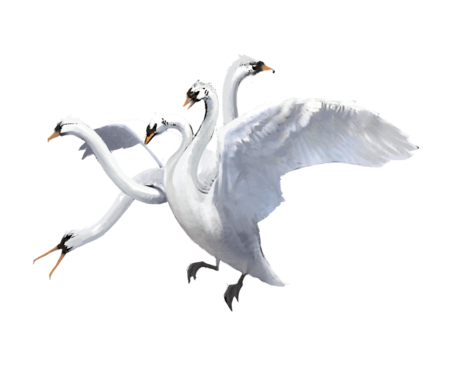 Hydraswan pre-order pack cosmetic pet. 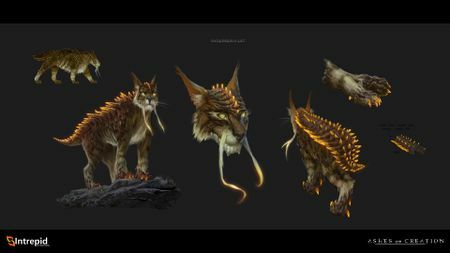 Cosmetic pets are available for purchase from the cosmetic store. Cute small pets were a Kickstarter stretch goal. 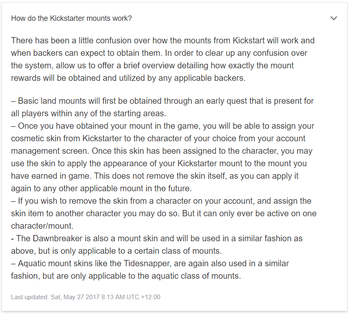 Multi-passenger group mounts were unlocked during the Kickstarter crowdfunding campaign. Dyes are normally one time use items that apply a cosmetic color change on certain items/gear. 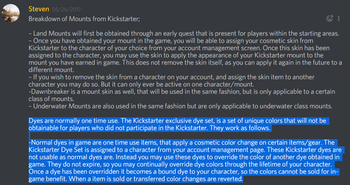 The Kickstarter and Summer crowdfunding dyes are sets of unique colors that are not obtainable by players who did not participate in Crowdfunding. These dyes are not usable as normal dyes are. Instead they are used to override the color of another dye obtained in game. They are assigned to a character from a user's account management page. They do not expire, so they may be used to continually override dye colors. Once a dye has been overridden it becomes a bound dye to that character, so the colors cannot be sold for in-game benefit. When an item is sold or transferred, color changes are reverted. The Tulnar race will be in place before Alpha-2. Concepts and early works are expected at that time. 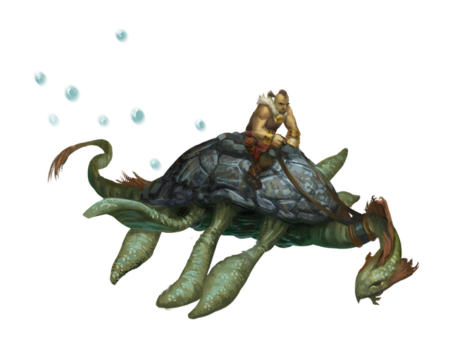 Mount barding cosmetic reward for backing at the Leader of Men level. 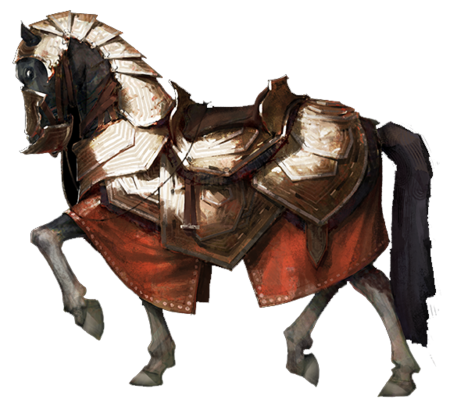 Mount barding is a cosmetic for mounts in Ashes of Creation. 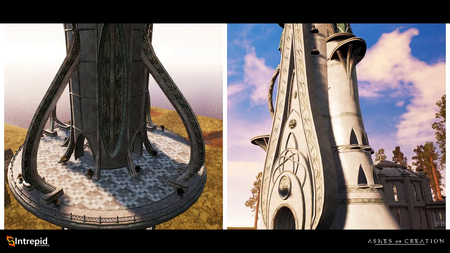 ↑ 1.0 1.1 1.2 Ashes of Creation Kickstarter. ↑ 13.0 13.1 13.2 13.3 13.4 13.5 Livestream, 17 May 2017 (30:53). ↑ 14.0 14.1 14.2 14.3 Livestream, 23 August 2017 (28:22). ↑ 16.0 16.1 Ashes of Creation - The visuals. ↑ 17.0 17.1 Kickstarter $1,750,000 Stretch Goal Unlocked, 13 May 2017. ↑ Interview, 31 October 2018 (6:00). 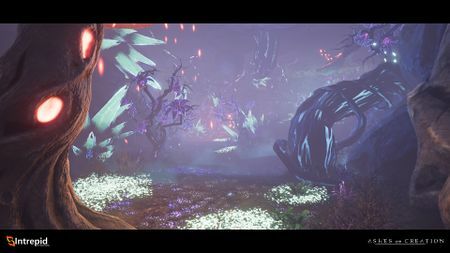 ↑ 21.0 21.1 Ashes of Creation Kickstarter - Over 9,500 Backers and Counting!! ↑ Livestream, 17 May 2017 (7:27). ↑ Podcast, 23 April 2018 (24:47). ↑ 25.0 25.1 Livestream, 26 May 2017 (49:05). ↑ Livestream, 26 May 2017 (3:04). 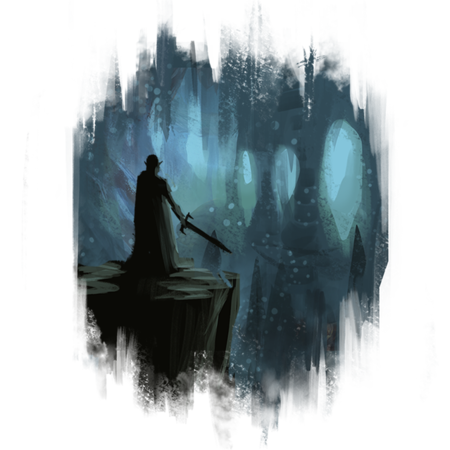 ↑ 30.0 30.1 30.2 Kickstarter $2,500,000 New Player Race Achieved. ↑ Livestream, 8 April 2018 (23:04). ↑ Livestream, 8 April 2018 (AM) (2:17). ↑ 41.0 41.1 Livestream, 17 May 2017 (11:27). ↑ 43.0 43.1 Interview, 20 October 2018 (5:51).